For the 2018 midterm elections, El Pueblo partnered with organizations across the state for a nonpartisan GOTV campaign, reaching over 90,000 registered voters, encouraging them to make their voices heard on Election Day or during early voting. Residents were also provided with nonpartisan bilingual voter guides, available both online and in print. Following the election, we organized staff and volunteer retreats to discuss its repercussions for the immigrant community, as well as plan for actions between now and November 2020. In North Carolina, a wave of new sheriffs were elected in the most populated counties with campaigns that highlighted building safety and trust between immigrants, people of color, and local authorities. We spoke with journalists about the Wake County Sheriff Election, asking that Sheriff-elect Baker keeps his promise to end our county’s partnership with ICE. We also held a benefit show at the Wicked Witch in downtown Raleigh, showcasing local artists who identify as immigrant, Latinx and persons of color. This month, El Pueblo worked alongside allies from diverse backgrounds to mobilize and educate voters ahead of the 2018 midterm elections. We helped create a nonpartisan voter guide, called thousands of registered voters across the state, and helped organize a series of candidate forums that allowed for community members to make their voices heard and be acknowledged by the candidates who are running to represent them in office. We also partnered with Deep South Entertainment for an evening at the NC State Fair called Noche Latina, where local Latinx artists performed to hundreds of visitors inside the Dorton Arena, celebrating the rich heritage of the Latinx community here in the Triangle. We also spoke out alongside allies against the threat from the president to end birthright citizenship for the children of immigrants. Angeline Echeverría on WRAL panel discussion about refugees from Central America (E). El Pueblo celebrated its 25th anniversary of La Fiesta del Pueblo, covering five blocks of Fayetteville Street with food, music, art and fun for the whole family. This event was also an opportunity for taking action, as the festival was held just over a year after Hurricane Maria, as well as just a week following Hurricane Florence. The festival’s art and entertainment reflected the strength and resiliency of the Latinx* community during difficult times. We were also proud of our staffer, DACA recipient Jorge “Tito” Ramos, whose Letter to the Editor was featured in the News & Observer, discussing the need to consider the lives of family members and loved ones when addressing the issues surrounding DACA recipients. El Pueblo has also been working with allies to provide nonpartisan information for the upcoming elections. For information in English, visit NCVoterGuide.org. In Spanish, we have prepared a print voter guide that will be mailed to Latinx voters throughout the state and also distributed in-person through Spanish-language newspapers and other Latinx and ally organizations. For online Spanish content, visit votemosNC.com. 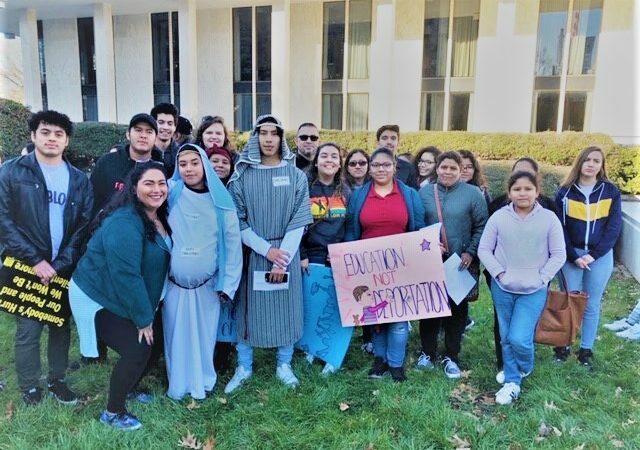 This past month, El Pueblo supported a rally organized by the Comite Popular Somos Raleigh for justice for Efraín Romero de la Rosa, an immigrant who died in custody of ICE after having been arrested in Wake County and transferred to Georgia for processing. He was one of 8 individuals who have done so in the custody of ICE in the last year. We also added to our monthly column in La Conexión, talking about the recent Supreme Court decisions with wide-ranging repercussions, as well as the fight to keep families together, both along the border and across the country. On Saturday, June 30th, El Pueblo participated in the Families Belong Together rally in downtown Raleigh, in conjunction with similar marches all across the country in solidarity with families at the border. Immigration advocates and grassroots leaders spoke about the humanitarian crisis at the border, as well as the reality of communities being terrorized every day by the actions of Immigration and Customs Enforcement, or ICE. Earlier this month, we joined the Adelante Coalition and other groups for the annual UnDOCUgraduation Ceremony at the General Assembly. Recent high school graduates made their presence known by visiting state legislators, requesting that North Carolina join other states in providing in-state tuition to undocumented and students with temporary immigration statuses. El Pueblo became a plaintiff in a lawsuit filed by the Mexican American Legal Defense Fund and Asian Americans Advancing Justice to stop the Trump administration from adding an untested citizenship question to the 2020 Census. We joined other immigrant community groups and allies at a lobby day on June 20th at the NCGA. Finally, we participated in a rally outside of the Terry Sanford Federal Building, demanding that Senator Tillis and other congressional representatives support an end to the separation of families across the border and across the country. This month, we finished our phonebanking campaign that coincided with the North Carolina primaries, encouraging voters to make their voices heard leading up to Election Day on Tuesday, May 8th. Community activists spoke with 21,500 registered Latino voters across the state. We will be conducting a similar campaign later in the year as we approach the midterm elections in November. Finally, we partnered with the NC Justice Center for a Know Your Rights and Power of Attorney session on Monday, May 21st. Visitors engaged in volunteer role-playing to prepare themselves for possible interactions with I.C.E. (Immigration and Customs Enforcement) and how to avoid deportation. Attorneys Kate Woomer-Deters and Beckie Moriello were present to aid in the training, as well as speaking on the importance of acquiring Powers of Attorney. Today’s clinic will serve as a follow-up, allowing previous attendees to begin the process of creating these legal documents. This month, we organized an Open Mic Night at the Wicked Witch in downtown Raleigh, where members of the Latinx community were invited to speak and share their stories about living in modern day America, all while in a safe space with friends and family in solidarity with each other. We also celebrated the decision by a Federal Circuit Court to protect the highly successful DACA program, which was at risk of being shut down through the racist policies of our president. On March 6th, our Youth Council led a rally outside of Senator Thom Tillis’ office in downtown Raleigh. The protest, called “The Death of DREAMs,” was a vigil style procession, where speakers shared the stories of young individuals who had been deported back to their home countries, and were subsequently killed. We also helped organize an event on Friday, March 16th called “Step Into the Spotlight” at The Wicked Witch in Raleigh, where youth and adults took turns speaking on the struggles of being an immigrant, undocumented and/or Latinx in modern day America. On March 21st, our youth travelled to Washington, DC, for the UnidosUS “Leaders in Action Summit,” where they lead a workshop for members of like-minded organizations from across the country and met directly with congressional representatives. El Pueblo youth member Santanna Rivera was featured in the UnidosUS March newsletter, speaking on the importance of voting during the upcoming midterms. This month, we participated in the annual Moral March, or HKonJ in downtown Raleigh, where tens of thousands of participants from across the state met to demonstrate solidarity between the organizations and their respective issues. We also took part in a city-wide letter writing campaign, led by Peace College graduate Trey Lynch, where dozens of volunteers wrote to their legislators in hopes of stopping the anti-immigrant bill SB 145. We also had El Pueblo youth members such as Reyna Gutierrez, and CLC member Maria Gonzalez speak with reporters about the Supreme Court decision on DACA near the end of the month. After the decision to end Temporary Protected Status (TPS) protections for 200,000 Salvadorans, Youth Council member Nicole Aldana shared her story with the public on how this inhumane decision would affect her family. Community Leadership Council member Maria Gonzalez also shared her story on how DACA has benefitted her life and emphasized the need for a Clean DREAM Act.